Tropical Marine Air Conditioning of Fort Lauderdale, Florida has marine air conditioning equipment and parts. 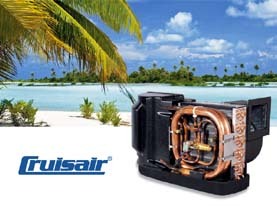 Tropical Marine Air Conditioning has parts and equipment for reverse cycle Self-contained, Split Systems, Chillers and 12 Volt marine air conditioning systems. Contact Us for more information and the service you deserve for all your marine A/C needs today! Dometic 2018-19 Boat Show Season Rebates! Get the info for rebates on Dometic gear. Tropical Marine Air Conditioning is here to answer all your marine air conditioning questions and with swiftness and accuracy to fill your marine air conditioning equipment and parts orders. Please note that Tropical Marine Air Conditioning also stocks controllers and accessories. Controllers come in programable and also value configurations to fit every budget and marine air conditioning need. Tropical Marine Air Conditioning has all the accessories for a successful installation of equipment. Tropical Marine Air Conditioning services southeast Florida and the Keys with a full line of marine airconditioning equipment and parts. Call 954-463-7309 or Contact Us for quality marine air conditioning equipment and parts.